The Epson Home Cinema 8350 arrives fresh from this year's CEDIA show, and it is a sight to see. 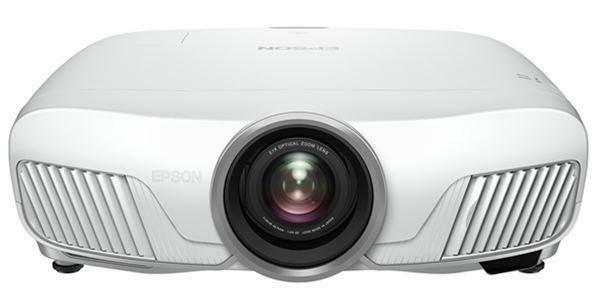 Epson has really outdone itself this year--the Home Cinema 8350 is a sub-$1300 1080p projector that delivers some serious performance. The Home Cinema 8350 is the successor of last year's Home Cinema 8100. The Home Cinema 8100 earned our Editor's Choice Award for being an exceptional value for the money. It had high brightness, great placement flexibility, and affordability both in purchase price and maintenance costs. The Home Cinema 8350 continues this tradition, bringing even better 1080p film and video performance into your home theater for less than $1300. There is no doubt this one earns this year's Editor's Choice Award for entry level 1080p home theater projectors. Image quality. There's no sense beating around the bush: the Home Cinema 8350 is a fantastic value. It produces a great picture for a very low price. Out of the box, its factory presets are geared for high light output in ambient light. So the first picture you see is bright, with decent color and average black level for illuminated rooms. To get it set for optimal video quality, the first order of business was to turn on Epson Super White, engage the auto iris, and change color temperature from 6500K to 7500K (more below on this). After these simple adjustments, the projector is transformed into an inexpensive 1080p powerhouse for dark room viewing. Epson Super White and the auto iris bring black level down, while highlights are brilliant and sparkling without any loss of detail. Color is accurate and true-to-life. These minor changes are all it takes to bring the Home Cinema 8350 into the big leagues. Lumen output. The Home Cinema 8350, like its predecessor, is very flexible when it comes to lumen output. This variability is accomplished through a variety of image modes, ranging from the very bright Dynamic mode to the more subdued Cinema mode. Each mode is built around an intended application, and all are useful in at least some capacity. Dynamic is the preset to use in a bright room, as it produces the highest lumen output - 1507 lumens on our test sample. While this is a slight decrease from the Home Cinema 8100 which measured in the mid 1700s, it is still plenty of light for a room with a couple of small windows or table lamps. In this environment, a 100" diagonal image is probably the maximum you will want to consider--anything larger can make the picture appear too dim. Conversely, if you want to "punch up" the apparent brightness and contrast, use the zoom lens to shrink the image down to 60" or 80" diagonal. As far as color and contrast are concerned, color balance is exceptionally good for a Dynamic mode--this was true with the Home Cinema 8100 last year and it is true again now. While there is a slight greenish cast to the picture, it's nothing compared to the Dynamic settings on some competing units. Black level is not as deep as it is under the Cinema and Natural settings, but in a room with ambient light that will not matter.